Southeastern Connecticut is an odd mix of pretty, historic shoreline towns, heavily-forested farming country, and glittering high-rise gambling casinos rising like the emerald City of Oz from the peaceful rural countryside. Ever since Connecticut's Mohegan and Mashantucket Pequot peoples came to agreement with the State of Connecticut on a degree of extraterritoriality that allowed development of resort gambling casinos on their tribal lands, southeastern Connecticut (map) has been booming. Foxwoods Resort Casino and Mohegan Sun, the casinos that began as a humble game of high-stakes bingo are now multi-billion-dollar Las Vegas-style pleasure palaces set in unlikely positions in the forested countryside. 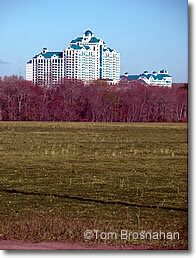 Rising above a farmer's field in rural Southeastern Connecticut, Foxwoods casino seems another world. They draw millions of visitors each year, most of whom go away happier in the head and lighter in the pocket. South of the casinos on the shoreline are the historic towns of Mystic and Stonington, both worth a visit, if only to clear your head after the dizzying sights of casino-land. Public transportation to the casinos is provided from several southeastern Connecticut towns by SEAT, the Southeastern Area Transit system.